One of the best things that fall brings with it is knitting. I tend to sew a lot, but it was so exciting to break open my knitting bag and get my needles going on some new projects! 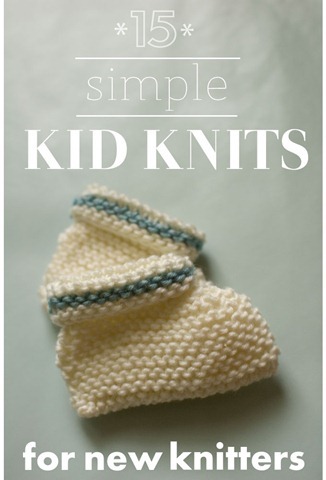 Are you new to knitting or looking for some quick knits for your kiddos (or upcoming babies)? This hat is knitted flat, so it’s perfect for those who aren’t quite ready for knitting in the round! These are so useful! Boys can wear them as bowties, or pair them with the above headband for girls! Â I love this little bag for keeping tiny treasures that my kids have collected! In her post she offers her variation, plus a link to the original pattern. The pattern uses an M1 stitch, which might be new for beginners. For a great demonstration of this stitch, see this video. I made one of these crowns for each of my girls a couple years ago and they still wear them for dress-up! Also, be sure to check out her pattern shop, it’s full of wonderful things to knit! these are wonderfully easy to knit and have so many variations to play with! Thanks for posting about our preemie hat!